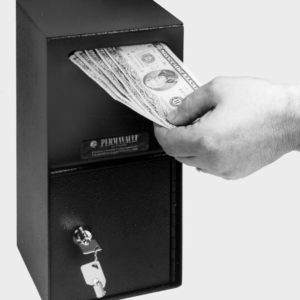 PV-814-K Equipped with dual custody safe deposit lock. Includes two (2) operator keys and one (1) guard key. 13″ x 8″ x 11-3/4″ 36 lbs. PV-814-C Equipped with UL approved Group II combination lock. 13″ x 8″ x 11-3/4″ 36 lbs. PV-814-E Equipped with Sargent and Greenleaf model 6120 electronic lock (up to eight user capabilities). 13″ x 8″ x 11-3/4″ 36 lbs. 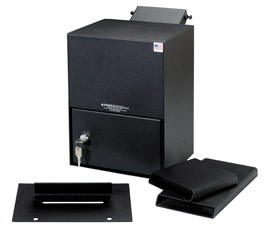 PV-1217-K Equipped with dual custody safe deposit lock. Includes two (2) operator keys and one (1) guard key. 17″ x 12″ x 12″ 56 lbs. PV-1217-C Equipped with UL approved Group II combination lock. 17″ x 12″ x 12″ 56 lbs. PV-1217-E Equipped with Sargent and Greenleaf model 6120 electronic lock (up to eight user capabilities). 17″ x 12″ x 12″ 56 lbs. 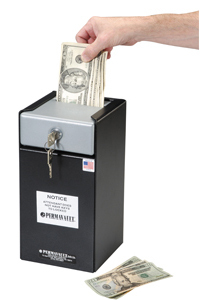 PV-1225-K Equipped with dual custody safe deposit lock. Includes two (2) operator keys and one (1) guard key. 25″ x 12″ x 12″ 75 lbs. PV-1225-C Equipped with UL approved Group II combination lock. 25″ x 12″ x 12″ 75 lbs. PV-1225-E Equipped with Sargent and Greenleaf model 6120 electronic lock (up to eight user capabilities). 25″ x 12″ x 12″ 75 lbs. PV-1234-KK Double compartment. 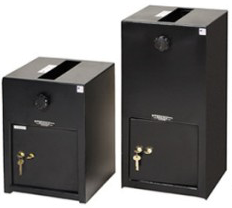 Equipped with two (2) dual custody safe deposit locks with two (2) operator keys and one (1) guard key per lock. Bottom storage compartment. 34″ x 12″ x 12″ 96 lbs. PV-1234-CC Double compartment. 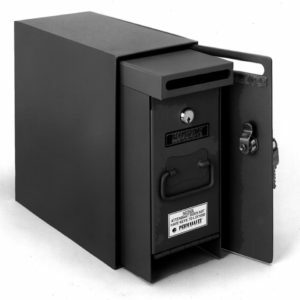 Equipped with one (1) dual custody safe deposit lock with two (2) operator keys and one (1) guard key and one (1) UL approved Group II combination lock. Bottom storage compartment. 34″ x 12″ x 12″ 96 lbs. PV-1234-EE Equipped with (2) Sargent and Greenleaf model 6120 electronic locks (up to eight user capabilities). 34″ x 12″ x 12″ 96 lbs.